“Come get me,” read the text Little Wind sent at sunset, several hours after the Army Corps of Engineers (ACoE) and associated agencies terrorized most of us out of Main Camp. Braver than me, she stayed past the official eviction deadline — 2pm on 2/22 — and risked a serious stint in jail if arrested for the third time in as many months. Hailing from Riverton and only 19 years old, she had been at Standing Rock off and on since August. Her only ‘crime’ was attempting to protect our water supply from yet another leaky oil pipeline across this profit-driven police state pretending to be the Land of the Free. Despite immediate fears of a federally orchestrated invasion, Little Wind remained to stand alongside her biological brother Big Wind and their extended family of fellow Water Protectors. She now asked for my help getting out only because she couldn’t physically stand — let alone run from cops in riot gear with machine guns — due to a serious ankle injury sustained a few days earlier. We didn’t know if her ankle was broken because Little Wind refused to go for an X-ray: she only had 27 dollars to her name and didn’t want to leave camp for fear that Bureau of Indian Affairs (BIA) Agents staffing the newest roadblock wouldn’t let her back in. Folks were being turned away merely for having sleeping bags in their vehicles, so she wasn’t just paranoid as she bore the pain and uncertainty of her situation. By now the highway was completely closed off, so going to get her meant hiking two muddy miles cross country, crossing a partially frozen river, and carrying her out piggy back praying that we wouldn’t get caught. Her injury occurred when she slipped on a muddy hillside while spreading straw from one of the 400+ bales that we scavenged from abandoned areas of camp. For the previous week several of us had been operating as the unofficial, unsupervised Oceti Oyate road crew. Our hope was to keep the dirt roads through camp passable while a geoengineered heat wave turned the place into a quagmire of sloppy snow, slippery ice, sticky mud, and standing water. Big Wind and Little Wind volunteering as the Standing Rock Road Crew. We focused our straw-spreading efforts on the hills and high traffic areas. Things were going well for our little road crew until four days before 2/22 when federal contractors brought in big trucks to remove piles of snow peacefully melting around camp. The overloaded trucks had to be pushed through the mud with bulldozers, tank treads and traction-less tires digging foot deep trenches throughout the encampment. Our roads were pretty much impassable from that day on. Government officials declared that snow had to be removed and searched for human bodies, but that was nonsense just like the hyped up notion that the Cannonball River could flood low lying areas of camp at any moment. At the time of writing (2/26) the four foot deep river is still six feet below minor flood stage and eight feet below levels that would threaten any of the camp. The NWS Advanced Hydrological Prediction Service does not forecast flooding in the foreseeable future. That river was just an icy trickle, but the state-sponsored BS still flows fast and thick. The phone number given to independent journalists seeking official press passes was bogus, and the requirements proved impossible to meet anyway. The mainstream media showed up for only a few hours, said what they were scripted to, and retreated through a police blockade totally impassable to the rest of us prior to the 2pm eviction order on 2/22. Mainstream outlets reported that the camp had been cleared the day before it actually happened and where nowhere to be found when a few hundred militarized police, a few dozen humvees, and a couple MRAPs stormed the camp on the morning of 2/23. Snipers sat on the hills surrounding camp, and a Border Patrol chopper chased down our drones and jammed our livestreams. That morning my friend and fellow journalist Ed Higgins was arrested for reporting the news. The rest of us livestreamers would have been arrested too if we were weren’t so fleet of foot or hiding in the rear with the gear from the very real terror your tax dollars just bought. The ACoE’s representative stated that they would not demolish structures during the invasion, but they did. The big, beautiful construction barn contained at least a hundred thousand dollars worth of tools and equipment, a bank of deep cycle batteries, fuels, motor oil, and other toxic materials. 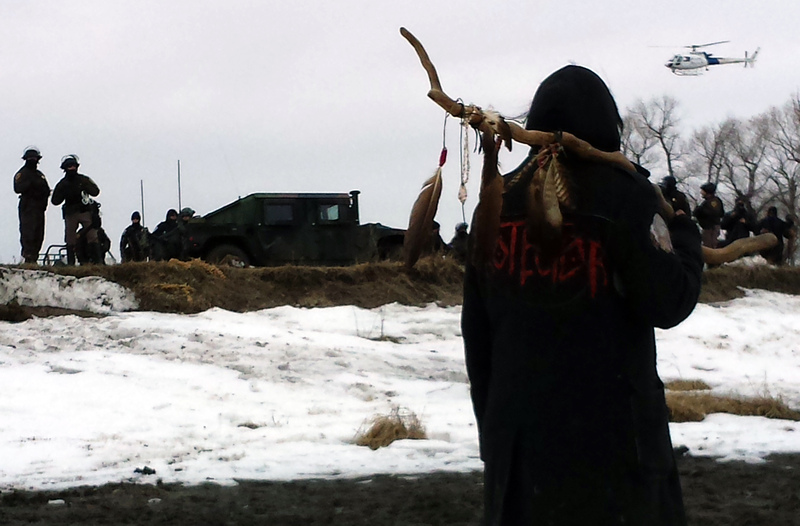 ACoE crushed it with an excavator while Water Protectors were still in camp, indubitably contaminating the area unnecessarily. 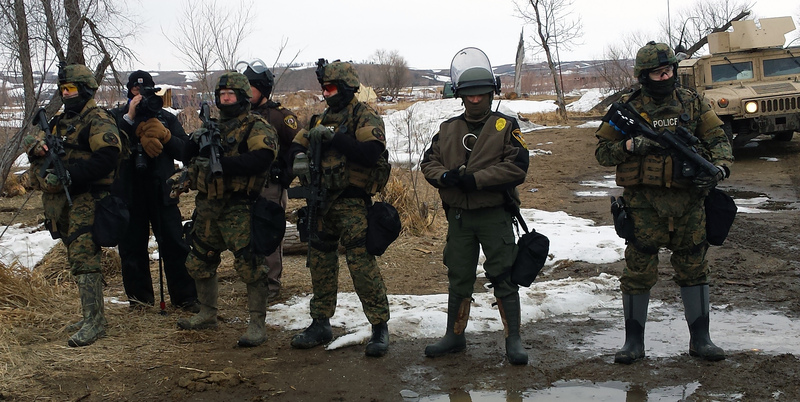 The Governor of North Dakota cited public safety and environmental health for evicting the camp, but would not speak on the disturbing presence of tons of Rozol rat poison around the camp and turning up in sick Water Protectors’ blood tests. 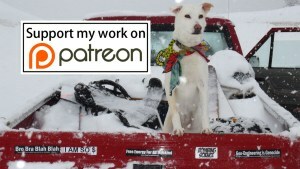 After 16 days in camp my dog is still coughing up blood, and I have never seen her so sick and lethargic. Endless story short, under cover of darkness I walked back into camp to get my friend Little Wind, but she didn’t want to leave anymore. I understood why. She was loyal to her cause and her friends despite great hardships brought on by corrupt government serving corporate greed. After a few nervous hours sitting together listening to cop cars stalking the road 60 feet behind her tent on Facebook Hill, she was ready to go. I picked her up and shamefully avoided our friends standing around a nearby fire because we both felt like bailers. The next morning I returned to camp to report the news despite my fears . Little Wind’s brave brother Big Wind was among the 47 people arrested on that disgusting day. BIA threatens to evict the rest of the encampments on Monday February 27th, so by the time this report goes to print the Water Protectors at Standing Rock may be but a memory. I hope that memory continues to awaken the world to the dangers of the creeping police state and the environmental pollution poisoning us all. One Love. Peace. Relieved to know you persist !